A helicopter platform developed by the team of Boeing and Sikorsky flew for the first time Thursday at the latter’s facility in West Palm Beach, Fla.
Lockheed Martin, the parent company of Sikorsky, said Thursday that SB-1 Defiant is powered by X2 technology and a participant in the Joint Multi-Role-Medium Technology Demonstrator program. The aircraft is fitted with rear-mounted pusher propulsors, coaxial main rotors and other tools designed to support infiltration, attack and assault, resupply and long-range transport missions. 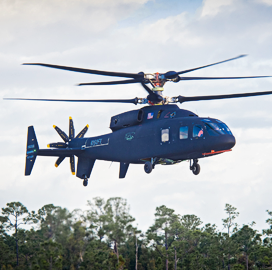 The Boeing-Sikorsky team designed the vehicle in an effort to help inform the U.S. Army’s Future Vertical Lift initiative and provide data for the military branch to create requirements for utility helicopters that are projected to enter service by early 2030s. Defiant represents the X2 aircraft produced in less than a decade, Lockheed noted. Sikorsky registered the new coaxial helicopter with the Federal Aviation Administration as "S-100" earlier this year.